The hyaluronic acid is the major component of the hyaline cartilage. In order to regenerate and function properly, the cartilage requires a constant supplementation of the hyaluronic acid which allows it to maintain the lubricity and prevents its desiccation. In contrast to injecting the hyaluronic acid directly into the joints affected with degenerative changes, the hyaluronic acid can now be administered in much easier and convenient way, in the liquid form - as a syrup. HYALUTIDIN HC Aktiv is the only product on the market which offers this way of the supplementation of the hyaluronic acid and chondroitin deficiency. The cartilage is idle, meaning it does not contain blood vessels. The articular cartilage is the only way in which nutrients can be delivered to the cartilage and waste can be removed. That's why articular cartilage is so important. With less than the right amount of hyaluronic acid, nutrients cannot be transferred to these cells and waste cannot be eliminated. For the cartilage to regenerate and function properly, it needs continuous replenishment of hyaluronic acid, which prevents it from drying out. The hyaluronic acid administered in this form, as well as other nutritious components contained in the supplement, are distributed into the digestive system and secreted to the circulatory system. Then they are delivered to all the areas of its deficiency - to the tissues, skin, eyes, bones, heart valves, intra articular plates and, most of all , to the joints. The synovial fluid is replenished with the hyaluronic acid, the amount of which may even surpass the quantity previously supplied to the body in the form of injection. Our joints, such as elbows or knees, are surrounded by the membrane, called the synovium or the synovial membrane, which comprises the capsule around the ends of the bones. This membrane secretes the fluid called the synovial fluid. Basically, this fluid is located in the articular cavities. It plays a principal role as a lubricant, shock absorber and a carrier of the nutritious substances. Thus, the synovial fluid is essential for the protection of the bones and joints. The cartilage located in the synovial fluid is a fibrous connective tissue. As an avascular tissue, the cartilage does not contain blood vessels, thus the synovial fluid is the only element which allows the supply of the nutritious substances to the cartilage and the removal of the waste. This is why the synovial fluid plays such a significant role. When the amount of the hyaluronic acid is lower than adequate, it is impossible for the nutrients to be supplied and the waste to be removed. The hyaluronic acid is present in every tissue of the body. Its highest concentration is in the synovial fluid, which bathes and lubricates the joints, as well as in the vitreous body of the eye and in the skin. The water retention and its binding in the extracellular matrix (ECM) is one of the principal biological functions of the hyaluronic acid. 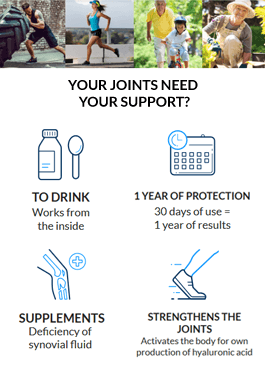 The hyaluronic acid definitely helps to improve the health of the joints, particularly by providing the cushioning in the joints and improving the quality of the synovial fluid. It is beneficial for people who need to improve the flexibility of the joints, especially the knee, wrists and fingers joints, by restoration of the cushioning of the joints. Hyaluronic acid is also recommended for men and women who experience the first signs of aging or for elderly people suffering from the diagnosed joint diseases. The hyaluronic acid is mostly obtained from the roosters combs and as such, it has too large chemical size to be effectively absorbed by the gastrointestinal tract. When it is directly extracted from the rooster’s comb, its molecular mass is about 1.2 to 1.5 million Daltons, which is why it can only be applied in the form of injections directly into the joint. However, the hyaluronic acid contained in the innovative formula HYALUTIDIN HC Aktiv was developed by the team of scientists in the Gramme-Revit centre in Germany. They established the special regulations of the fermentation processes of the hyaluronic acid, which allows the lower molecular weight of the hyaluronic acid molecule. The usage of the lower versions of the molecular weight in the HYALUTIDIN HC Aktiv enables its high absorption in the gastrointestinal tract, thereby assuring its effective use in the major sites of its deficiency in the body. It allows the administration of the hyaluronic acid orally, as the dietary supplementation. Hyaluronic acid is a natural substance which is present in all living organism and has a rather simple chemical structure. It belongs to the group of glycosaminoglycans. It was first described as a ‘goo" (the term used to refer to a slippery, sticky, semi- liquid or semi-solid substance) molecule, an ubiquitous carbohydrate polymer which is a part of the extracellular matrix. The Hyaluronic acid is a polymer of disaccharides, consisting of D-glucuronic acid and D-N-acetylglucosamine. The size of the polymers may vary from 5000 to 20.000.000 Da in vivo. The average molecular weight in the human synovial fluid is 3 to 4 million Daa, whereas the hyaluronic acid purified from the human umbilical cord amounts to 3.14 million Da. The hyaluronic acid is a key component of the articular cartilage. Its ability to bend and absorb water contributes to maintaining the flexibility of the cartilage (its resistance to compression) and the lubrication of the joints.